Are you really 'bad'? People aren't just born 'bad'...there is usually something that happens to make them 'bad'. Did you have a bad childhood? Did you get in with the wrong crowd? Are you struggling with your mental health and no one is helping? Are you crying out for attention? Do you have an addiction you need to feed and no one is there to help you? Have you experienced a trauma or had a bad life experience? Whatever has happened to you, I want you to know that you have my sympathy BUT I also want you to know that you need to stop as your actions have consequences that you probably haven't even imagined. What am I talking about? 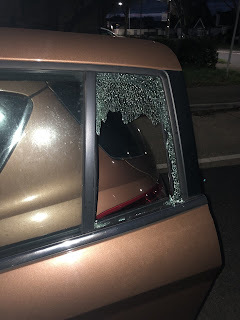 Well, a week or so ago my car was broken into. The window on Smidge's side of the car was smashed and the person reached in and opened the door. Then then obviously rooted around all the crap that comes with having two children and using the car a lot and stole my instax camera that I'd had for less than a month and also a Disney on ice bag with a plastic Olaf cup inside. When I first discovered what had happened I instantly imagined what had gone on. I pictured a desperate, sad man rooting through my car searching for anything that he could steal and sell to pay for his next hit. Maybe it wasn't drugs...maybe he was so hard up that he needed to steal to buy food? Maybe that was it? I actually felt sorry for whomever broke into my car and I came to the mindset that the person who did it clearly needed my belongings more than me. I figured that even through they were a 'bad' person, they must have had good reason to do what they did and they were obviously desperate as no one breaks into cars and steals for fun right? How naive I was. This week I finally plucked up the courage to look at the CCTV that we have. Oh yes, I didn't mention that did I? We had CCTV that just so happened to catch the end of the car in frame. I had expected to watch it and see a man work quickly and frantically to root through my car and find my camera. Only it wasn't. When I watched I saw a woman. A woman who looked pretty well put together. Had nice, clean clothes on and her hair brushed back. She kept watch. All I could see was her for the first few minutes of the clip. Finally once they had finished climbing over my children's car seats and treading on my children's paintings they'd done the previous day at pre school, I saw something that made me feel sick. A man walked away from the car wearing what looked like designer clothes and nice trainers and then what looked like a boy followed him. I say it was a boy because he was a lot shorter and slimmer than the man and he walked in a childlike way. He was also the one that was carrying the Disney on Ice bag. If this was a man, why would he want a Disney on Ice bag with an Olaf mug?? It looked like a family affair and that made me sick to my stomach. I didn't and still don't know what to think. I don't know this 'families' situation but they did not look particularly hard up. Why would they stoop so low as to do this? Do they understand the amount of damage they caused? This woman that was there must had seen their was car seats and kids stuff in the car. How could she do that to another woman?? I can't understand it. Are they just 'bad' people? But, I had always thought that 'bad' people could be saved. I had always tried to see the good and the light that was inside of everyone but I can't with these three. They don't know what they have done. To them they probably just thought they smashed a window and stole some stuff but it is so much more than that. They made my son feel unsafe. Pickle started asking if the bad men would come back so we told him that the police had caught them and put them in jail. That's not true though. They are still out there...possibly doing this to other people. They don't know how much money they cost us at a time where our income is strained anyway. They didn't know I'd just paid a tax bill. They didn't know we'd just paid and booked our 30th birthday party. They didn't know we'd just paid for our holiday and on top of all that I am on maternity and it had just been Christmas. Did they think about that as they smashed the window? Probably not. Did they think about the impact it would have on me? I can't stop asking questions that I will never know the answers to. Did they target my car on purpose? Do they know me? Will they come back? What have they done with our stuff? I have become almost OCD about making sure the house and the car is locked. We are arranging an alarm to be fitted on the house because if I feel like this about my car being broken into, how on earth would I cope if it was the house? They just don't know what they have done. So to the 'bad' people out there who do 'bad' things...I don't know you. I don't know your history and your situation BUT I will continue to believe that there is good inside of everyone and that everyone can be helped. I beg you to just think about the repercussions of what you do. Not just the financial cost of damage and crime but the emotional and mental cost too which is just as, if not more, important. Think about it and then maybe find another way.